Keough Construction Management provided design build services for the recently completed fish transfer facility for KSJ Seafood in Galilee, RI. 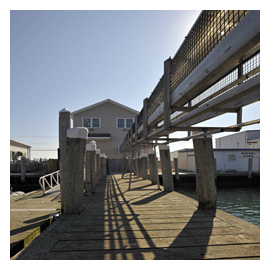 Our scope included obtaining Coastal Resource Management Council, DEM, Point Judith Harbor Commission and State of Rhode Island Building permits along with coordinating with the neighboring US Coast Guard boathouse. KCM worked closely with its client to deliver an on schedule and on budget facility. The building is located on the wharf in Galilee and within the FEMA designated velocity flood plain. Because of its location KCM was responsible to incorporate all code required structural reinforcement, storm pressure relief panels, and flood vents into the design. Floor elevation within the flood plain is critical and KCM coordinated all appropriate grades to address the regulation along with providing a functional platform for unloading and transporting product. Prior to occupancy, KCM coordinated the installation of Owner furnished processing.